Rep. Pamela Powers Hannley (right) and Republican challenger Ana Henderson. The debate video below reveals clear differences between the candidates on key issues such as the minimum wage, food security, the ratification of the Equal Rights Amendment (ERA), climate change, abortion, gun violence, and more. The Citizens Clean Elections Commission (CCEC) conducts candidate debates, videotapes them, and stores them on their website and YouTube channel. 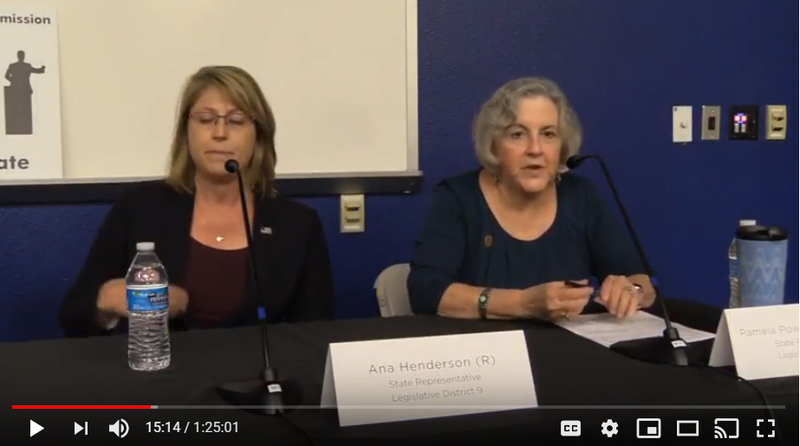 If you live in a district other than LD9, check out the CCEC archive for the other 2018 debate videos. For Southern Arizona Legislative Districts, here are links to debates for LD2, LD3, LD10, LD11, LD8, and LD14. (The LD9 debate is embedded below. The LD9 debate covered a lot of ground. The first half hour included the intros and the questions that were asked of every candidate. The rest of the debate was made up of questions from the audience, which was predominantly Republican. The audience questions can be directed at everyone or just one candidate. Here is a list of debate topics and the time stamp. Previous articleCountdown: What Are the Most Effective Things To Do? Next articleFLYING SOLO? McSally ONLY Major Senate Candidate With No Employees, Paying No Payroll Taxes; IRS/State Violation?